I was in New York last week for the annual Baker Street Irregulars Dinner. I was invited on behalf of EQMM. 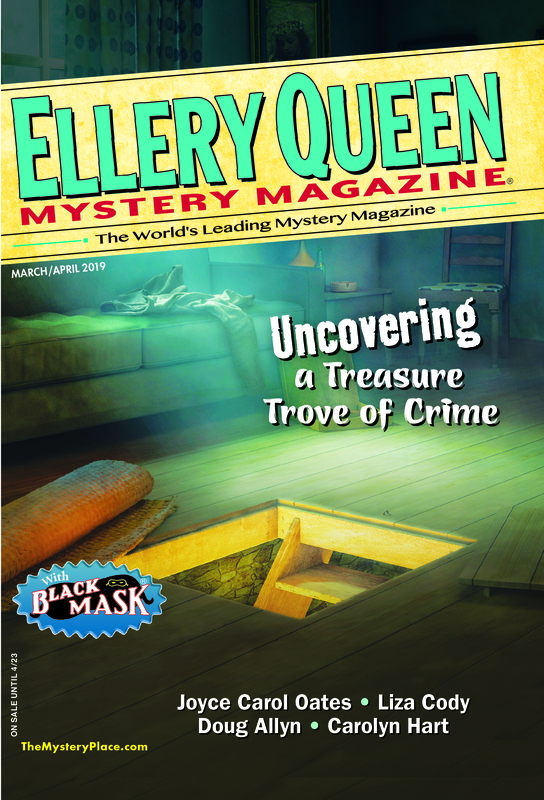 For years, EQMM’s February issue has been a celebration of Sherlock Holmes, and each year, for the Baker Street Irregulars (BSI) dinner, we have provided copies of that issue for all attendees. The invitation came from Mike Whelan, the president of BSI, who said the organization wanted to show their appreciation to EQMM for our support of the organization and our enthusiasm for Sherlock Holmes. I’m getting ahead of myself. There may be some readers unfamiliar with the BSI. In Conan Doyle’s original stories, there was a band of street urchins, led by a boy named Wiggins, whom Sherlock Holmes would enlist to help in his search for clues. Holmes referred to the kids as the “Baker Street Irregulars.” In 1934, essayist/journalist Christopher Morley gathered a dozen or so men Holmes aficionados, including novelist Vincent Starrett and actor/playwright William Gillette, for a dinner in New York to celebrate the “Great Detective.” And the BSI, one of the world’s preeminent literary societies, was born. Membership to the BSI is rather elite. Each year a few new members are admitted based on their scholarship, participation in smaller “Scion” societies, and dedication to all things Sherlockiana. Each new member is given a title or nickname taken from the Conan Doyle canon. This process is called “Investiture.” The BSI did not admit women as members until 1991. It was quite an honor to be invited to the dinner, and so I was excited to attend. I took a “red-eye” flight from the West Coast on Tuesday night. I’m one of those people who can only fall asleep in a bed, so the likelihood of getting any rest on the way to New York was slim. One of the challenges of arriving for an event so early in the morning is that hotels rooms are usually not available for checking in until the afternoon. In this particular case, very late in the afternoon. So I was terribly tired by the time I got into my hotel room. As I unpacked I discovered that the socks and underwear I’d set out for myself were probably in my closet back home, since they were nowhere to be found in my luggage. I also realized that my tuxedo trousers were probably in same closet, still on their hanger, and not with the rest of the tuxedo in New York. I would have to do some shopping. The Sherlockian weekend got off to a start with the Distinguished Speaker Lecture on Thursday night. This year’s speaker was playwright and screenwriter Jeffrey Hatcher, author of the stage plays Dr. Jekyll and Mr. Hyde and Sherlock Holmes and the Adventure of the Suicide Club, as well as the screenplay for the 2015 film Mr. Holmes starring Ian McKellen. Hatcher gave a thoroughly entertaining talk about the various castings of Sherlock Holmes on stage, film, radio, and television. He told various personal anecdotes, including experiences working with Ian McKellen, and a time when the playwright had to step in and play the role of Holmes in one of his plays when the lead actor, for medical reasons, was unable to perform. When I arrived, I was at first lost in a sea of unfamiliar faces. Peggy Purdue, curator of the Arthur Conan Doyle Collection at the Toronto Reference Library, whom I’d met and worked with several times in the past, helped me out by making a few introductions. But soon I spotted a number of old friends, including Terence Faherty, S.J. Rozan, Jan Burke, and Dana Cameron, all of whom should be familiar to EQMM readers for their short stories. Leslie Klinger, the attorney responsible for the “Free Sherlock” Supreme Court case was there, as was novelist Lyndsay Faye and Sherlockian scholar Peter Blau. Friday evening I dressed up in my tux. My pair of black chino slacks went well with the rest of the tuxedo. I prayed that the lighting would be dark enough that no one would notice. At the dinner itself, I found myself assigned to a table directly in front of the stage, seated with an impressive array of tablemates, including BSI President Mike Whelan, BSI Board members Tom Francis and Bill Vande Water, Jeffrey Hatcher who was the distinguished speaker from the previous evening, novelist/screenwriter Nicholas Meyer, and Pulitzer Prize winning Washington Post writer Michael Dirda. To my left sat Bert Coules, a BBC playwright/producer who had adapted the entire Sherlock Holmes canon for BBC Radio. Coules’ credits also include radio adaptations of work by Val McDermid, Ian Rankin, G.K. Chesterton, and Ellis Peters. The Program consisted of various rituals, songs, and speeches. Bert Coules spoke about Edith Meiser, an actress and maverick radio writer/producer who brought Sherlock Holmes to radio in the 1930s and 40s. Since this year marks twenty-five years since women were fist admitted into the Baker Street Irregulars, there were several entertaining presentations celebrating women’s roles in the organization. reviews of our Baker Street Irregulars Press titles. My voyage home turned out to be as venturesome as my trip there. A light snow fell on New York City on Sunday morning. It wasn’t a lot, but it was enough to delay my departure from JFK by two hours. Six hours after that, I arrived at Seattle-Tacoma International Airport just in time to miss my connecting flight. And so I spent the night at SeaTac, wandering the empty terminals, pausing to read, work, and sip coffee. It gave me plenty of time to consider my takeaway from the BSI Weekend. I was struck by the membership’s intellectual demography. This was a group that consisted largely of academics, attorneys, business executives, and other professionals, all of whom possessed a playfulness as well as a strong attraction to the workings of the mind, as demonstrated in the Sherlock Holmes stories. The attendees also demonstrated a profound dedication to the literature of Sherlock Holmes and to Sir Arthur Conan Doyle. This was a very literary group, to be sure. But their focus was Doyle and Holmes, the stories, the characters, and the world of a London lit by gas street lamps and echoing with the clap-clap of hansom cabs. My final observation about this group and their organization was attention to history. I don’t mean the history of late-Victorian and Edwardian England, although that is certainly something that the attendees appreciated. I mean to the sense of history of their organization. The entire event was punctuated by rituals, songs, and retrospection. One of the major activities of the Baker Street Irregulars is archiving their own history, and they do this with joy through oral histories, photographs, and preservation of documents. I had the impression that the BSI’s exclusion of women members for its first 57 years was for reasons of sexism or male chauvinism—not entirely, anyway—rather it was out of respect for tradition. This respect for tradition even came through as various speakers talked about their own defiance of tradition in 1991 that led to the change in the BSI’s membership policy. I hope to return to some future BSI event. I also plan to explore local Sherlockian gatherings. Most importantly, I’ll look back to my first BSI dinner with fond memories of warmth, mental cogitation, and a love of a very specific history. This entry was posted in Awards, Books, Characters, Conventions, Fiction, Genre, Guest, History, Holmesian and tagged baker street, baker street irregulars, bsi, crime, detective, fiction, history, holmes, literature, sherlock, sherlock holmes, victorian. Bookmark the permalink. Steve, what fun. Thanks for telling us about it. Thanks for sharing the weekend with those of us who weren’t able to be there, Steve! Love this write-up, Steve! Always want to attend this myself, and glad to be enjoying it vicariously here! Sounds like a terrific time.